John Irving’s latest novel, Last Night in Twisted River, thrusts another unforgettable character into his reader’s imaginations. Like Garp and Owen Meany, Ketchum, a grizzly old log-driver, won’t easily be forgotten. Centered on the dichotomy of a gruff exterior and tender heart, Ketchum’s character comes to life in his relationship and utter loyalty to Danny Baciagalupo, a boy of 12 when the story opens, and Danny’s father, the camp cook, “Cookie” or Dominic Baciagalupo. A strange accident forces Danny and his father to flee Twisted River, the logging camp that has been Danny’s only home, and commences a series of moves that span more than 50 years for Danny. Through the years, Ketchum keeps a close eye on the cook and his son, advising them how to best protect themselves from the man they’ve sought to escape. Ketchum’s affection for Danny is not only because of his love for Cookie, but also because of his love of Danny’s mother, Rosie, (an affair Cookie acknowledges) and the guilt he carries of his part in her accidental death, something that happened when Danny was only two. Danny grows up to become a writer, and thus the loose autobiographical nature of Last Night in Twisted River emerges. Several of the eight novels Danny publishes sound vaguely like those of Irvings. And, a few of the details of Danny’s life (age, schools) reflect Irving’s as well. 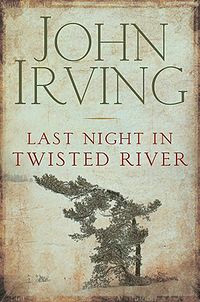 To some extent Irving acknowledges the autobiographical nature of his writing in that Last Night in Twisted River is a story within a story – by the end, Danny (the writer) has begun his ninth novel that begins in the logging camp, centers around Ketchum, and has the same first sentence as Twisted River. Like his other novels that I’ve read, Irving skips back and forth in the chronology of his narrative, but uses the jumps expertly to weave plot and people into a story so thick and real you’ll forget that you haven’t always known them. Aside from the mastery of narrative and characterization, I loved Last Night in Twisted River for what Irving shared about being a writer. Through Danny’s experiences, Irving talks at length about his craft, how he structures his work and life as an artist. It was as if Irving was preempting the interviewer’s tired question, “Tell me about your process.” Admittedly, Irving can claim this is Danny’s experience and not his own; regardless, the insight was intriguing to me. With another star performance, Irving maintains his place on my shelf as a favorite writer. Excellent review! I love Garp and really liked Owen Meany, and now I’m basically committed to reading as many Irving novels as I can 🙂 I’m drawn to reading The Cider House Rules next, but this will probably come right after. I feel the same way. I just picked up A Widow for One Year and am looking forward to it.